Obituary – Talbot, Marjorie Ellen (Kennedy) « Perry High School Alumni Association, Inc.
– daughter of Mr. and Mrs. Ivan L. Kennedy of 715 Tenth street, was born in Perry in 1921 and has lived here ever since. She was in the band and orchestra for seven years. She was in the senior play this year and secretary-treasurer of her home room. Her prime achievement was the winning of first place in trombone solo at the Tri-state band festival at Enid this year. Her hobbies include music and sports. Next fall she plans to enter college. Marjorie Ellen (Kennedy) Talbot, age 85, of Universal City, Texas, died Tuesday, February 27, 2007. She was born March 18, 1921, in Perry, Oklahoma, the daughter of Ivan Lynn and Hazel (Eby) Kennedy. She resided in Perry until she graduated from Perry High School. She then attended Oklahoma A & M (now Oklahoma State University) and was a member of the Symphonic Band. On July 5, 1942, she married George Edward Talbot. He died September 25, 2000. To this union two children were born: Sue Ellen Talbot and James Edward Talbot. She was an Air Force wife and a homemaker. She was a member of the Universal City United Methodist Church in Universal City, Texas. She was preceded in death by her husband; her parents; one sister, Carol Plessinger; and one brother, Bob Kennedy. 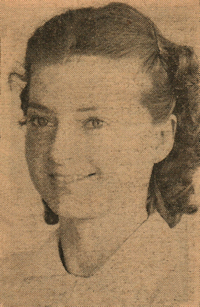 She is survived by her children: Sue E. Talbot of Coldwater, Kansas; and James E. Talbot and wife Kay Pils, of Austin, Texas; four sisters: Warenne Harris, of Winnetka, California; June Jerome, of Shawnee, Oklahoma; Betty Anderson, of Prague, Oklahoma; and Donna Golliver, and husband Mike, of Enid, Oklahoma; five grandchildren; nine great-grandchildren; and a host of nieces, nephews and friends. Marge will always be remembered for her music. She played many instruments. She volunteered many hours playing for a local nursing home, and then also in the assisted living complex where she resided. She also did many beautiful oil paintings. Her sense of humor never left her, and she made up many memorable poems for her friends and family. She will be greatly missed, as she touched many lives during her lifetime. A memorial service was held at 2 p.m. on March 2, 2007, at the Universal City United Methodist Church. A graveside service was held on Saturday, March 17, 2007 at 11:00 a.m., at the Grace Hill Cemetery in Perry, Oklahoma. Memorials may be made in her name to any local Hospice unit of the donor’s choice, or to the Universal City United Methodist Church, 90 Winn Avenue, Universal City, TX 78148.